The Mohs scale of mineral hardness characterizes the scratch resistance of various minerals through the ability of a harder material to scratch a softer material. It was created in 1812 by the German mineralogist Friedrich Mohs and is one of several definitions of hardness in materials science. By determining the hardness of a mineral, we can make decisions about the ways in which it can be used. Mohs based the scale on ten minerals that are readily available. 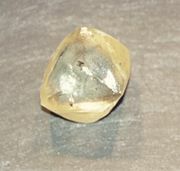 As the hardest known naturally occurring substance, diamond is at the top of the scale and is given the rating of 10. 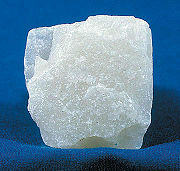 At the other end of the scale is talc, a very soft mineral, which is given a rating of 1. The Mohs scale is not a linear scale. For example, corundum (9) is twice as hard as topaz (8), but diamond (10) is almost four times as hard as corundum. The table below shows the scale and compares it with absolute hardness measured with a sclerometer. A mnemonic that may be used to remember the above table is: The Geologist Can Find An Ordinary Quartz (that) Tourists Call Diamond. The hardness of a material is measured against the scale by finding the hardest material that the given material can scratch, and/or the softest material that can scratch the given material. For example, if some material is scratched by apatite but not by fluorite, its hardness on the Mohs scale is 4.5. On the Mohs scale, fingernail has hardness 2.5; copper penny, about 3.5; a knife blade, 5.5; window glass, 6.5; steel file, 6.5. Using these ordinary materials of known hardness can be a simple way to approximate the position of a mineral on the scale. The table below incorporates additional substances that may fall in between two levels. ↑ Mohs scale of Mineral Hardness American Federation of Mineralogical Societies. Retrieved May 10, 2007. ↑ A sclerometer is an instrument used by mineralogists to measure the scratch hardness of materials. ↑ What is Important About Hardness? Amethyst Galleries. Retrieved May 10, 2007. Malzbender, J. (2003). "Comment on hardness definitions." Journal of the European Ceramics Society 23: 1355. Mineral Gallery. 2000. What is Important About Hardness? Amethyst Galleries. Retrieved May 10, 2007. Mohs Hardness Scale by Gordon England. History of "Mohs scale of mineral hardness"
This page was last modified on 13 October 2018, at 16:16.